Isn’t it too late to discuss what are the key elements of email marketing trends 2018 at the fag-end of March? Well, yes and no. Yes, because a large number of posts elsewhere have analyzed trends in email marketing in 2018 threadbare by now, many of them as early as September 2017. No, because the newer regulations like the GDPR looms close by, and no discussion on email marketing and automation predictions for 2018 can be said to be complete without due weightage to the GDPR. What is email marketing as per email marketing trends 2018? Email marketing is the use of email to regularly send bulk promotional messages to customers and prospects, all of whom have expressly given their consent to receive communications from you. Permission-based marketing, as Seth Godin puts it. Regularity: Not a one-off event. Bulk email: Need some tweaks or specialized services to send in bulk. Target groups: Includes both customers and prospects. The study of email marketing trends 2018 begins with mailing lists. When you have a mailing list ready, are you good to go? It depends on whether you know the engagement levels of the subscribers. If your list is any older than 6 months, you have no idea how many of the email addresses are currently valid. HubSpot reports that every year, the quality of your email list degrades by 25-30%. In other words, roughly one of out of every four email addresses in your mailing list is no longer valid. If you send out emails to all these addresses without to verifying the addresses, a large number of them will bounce – roughly 1 out of every 4 emails you send out are likely to bounce. And neither your Email Service Provider (ESP) nor the Internet Service Provider (ISP) is going to pardon you for that any time soon. Punishments can range from refusing to carry your emails to imposing financial penalties and labeling you a spammer – each of these can seriously set back your business. Email verification is the process of verifying whether the email address actually exists without actually sending an email. The steps of email verification begin from simple tasks like checking the syntax (e.g. ‘Is there an “@” in the address?”) to complex processes that test if the email address is invalid, disposable, role-based and so on. How to verify email addresses? You may verify email addresses of your subscribers in one of the two ways. Every time a visitor on your site signs up and submits their email, there’s a chance the email address entered is incorrect. Gradually, your subscriber list gets a sizeable number of incorrect or invalid addresses. If the address entered is correct, but does not belong to the person who has registered, double opt-in will be fine. But if the address is invalid, incorrect, you may keep sending subsequent email campaigns and keep getting bounced emails. Email verification API is the solution to the problem, if you go by the email marketing trends 2018. Email verification API will verify the email address in real-time. The moment the visitor keys in the email address and hits enter, a set of actions are triggered. The API verifies the validity of the email address. All this takes no more than one or two seconds, and yet brings huge benefits. It ensures that every email address entering your mailing list is valid. Email marketing trends 2018 requires you verify all the email addresses on your subscriber list. To do this, you may use any of the various email verification services available. All you need to do is to upload your subscriber lists (data confidentiality is assured); the email validation company will run your mailing list through its proprietary software for testing the email hygiene. At the end of the process, it will separate out which addresses are valid, which are invalid, which are role-based and which are not-safe-to-send. Email verification does not require you do download any software; they are offered in the form of easy SaaS (Software as a Service). Email verification and list cleaning help maintain the hygiene of your subscriber list. Prominent email verification companies include Kickbox, BriteVerify, QuickEmailVerification, XVerify and ZeroBounce. Many of them offer a free trial – you can check out each of them with a small number of addresses before you sign up for their paid services. Others, like Wishpond, can offer additional services like contests and bars, in addition to email marketing. It’s important to note that B2B email addresses die out more rapidly than B2C. It is important to understand the role of ESPs when you are trying to figure out what are the email marketing trends 2018. ESPs like Gmail and Yahoo satisfy most general needs of people using emails. Using their free services, you can write, edit, receive, store, forward, delete emails and do pretty much everything that you’d want to with any email service. There is a limitation, however. They are not meant to be used as a bulk email sender. Their servers aren’t designed to allow you to send 50,000 emails in a couple of minutes. Most of them limit the number of emails you can send on a daily limit. While this limit is more than generous for non-commercial purposes (Gmail allows you a max of 500 emails per day), it’s extremely insufficient for commercial purposes, where marketers send out hundreds of thousands of emails on a given day. 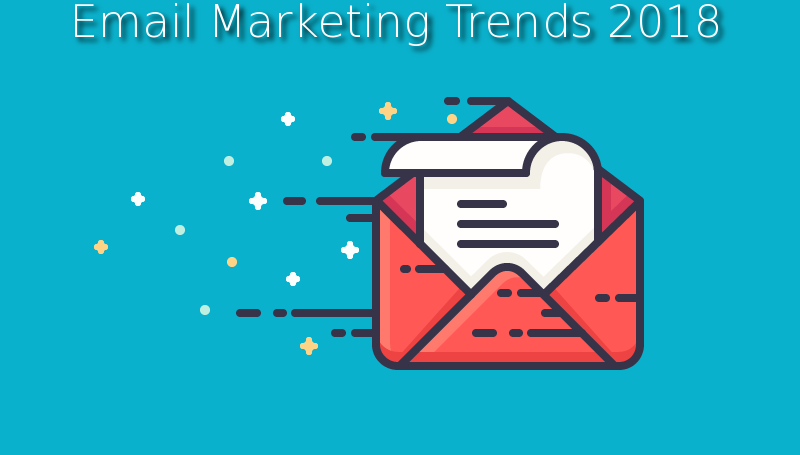 Email marketing trends 2018 says this is where you need the services of specialized ESPs. ESPs like MailChimp, CampaignMonitor, ConstantContact, MyEmma, Drip, MailerLite and SendLoop have powerful servers that are tuned to carry hundreds of thousands of emails in a matter of minutes. Apart of the huge number of emails you can send through these ESPs, they provide you a lot of back-end value. You can do A/B testing, schedule emails, get delivery reports, study delivery rates and open rates, get dedicated IPs… there is a whole bunch of things. General Data Protection Regulation (formally GDPR 2016/679) is a law that seeks to protect the privacy of data of all individuals residing within the European Union (EU). It impacts businesses that are either based in the EU or use or process private data of individuals residing within the EU. The convenience of sending and receiving emails has also led the problem of spamming. Unscrupulous marketers bombard people with huge number of unsolicited emails, often clogging mailboxes and impairing communications. In most cases, these emails have no Unsubscribe button with which to opt out of the spam. And to make matters worse, many of these messages are fraudulent, tempting people into all sorts of Ponzi schemes or unbelievably low-priced premium brands. Acts like the CAN-SPAM act have gone a long way in curbing this menace. The latest regulation from the European Union (EU), the GDPR is expected to give regulators more teeth and clamp down upon erring marketers. It centers around giving ‘digital rights’ over personal data. To begin with, the GDPR divides data handlers into two classes: data controller and data processor. The regulations apply if the data controller is based in the EU or the data subjects (to those individuals the data relates to) reside in the EU. All responsibility is placed primarily on the data controller even if the data processor works for the data controller. In some cases, the distinction between a data controller and data processor is easy. Let’s say your subscriber list has email addresses of 50,000 subscribers to whom you intend to send promotional emails. But before you send out emails, you wish to verify the email addresses. So you use the services of a list cleaning company that will verify all email addresses and provide you with the results. Based on these results, you decide which subscribers to email to and which addresses to drop. Here, you are in a controlling position, as in you are making all the important decisions of how to use the data. That means you are the data controller. The email verification company, on the other hand, has processed the data on your behalf, but otherwise has no control on how to use the data. That means the email verification company is a data processor. However, sometimes the distinction isn’t easy. Let’s say you are a small business enterprise and you have hired a certified accountant to take care of all your tax calculations and liabilities. Is your accountant a data processor? All the data of income and expense most certainly belongs to you, and it is you who has handed over the data to the accountant to work out how much you owe the government. Yet, you most likely aren’t qualified to make any significant decisions regarding your tax liabilities. It is your accountant who will make the decisions and you are unlikely to contest whatever her decisions are. That means that your account isn’t just processing your data, she’s deciding how the data will be put to use. In other words, it makes your accountant a data controller. A data processor is GDPR compliant if they have in place all the physical, technical and administrative security measures in place to protect the data they have been asked to process. The GDPR will have a huge impact on all businesses. Email verification companies are data processors. Marketers are data controllers. That means as a marketer, you’ll want to do business only with those data processors who are GDPR compliant. So these are the 3 most critical elements of email marketing trends 2018. Of course, there are other dimensions to email marketing too, and we’ll soon come up with a second part to this post. Thanks for reminding, George. I’ve added it!